Why #32 Eat an Oyster? I have spent my life vilifying the oyster for being slimy, snotty, ugly and gray. I realize that adding “eat an oyster” to my list of fears must seem ridiculous. But to me, the oyster is the gatekeeper to all worrying foods. 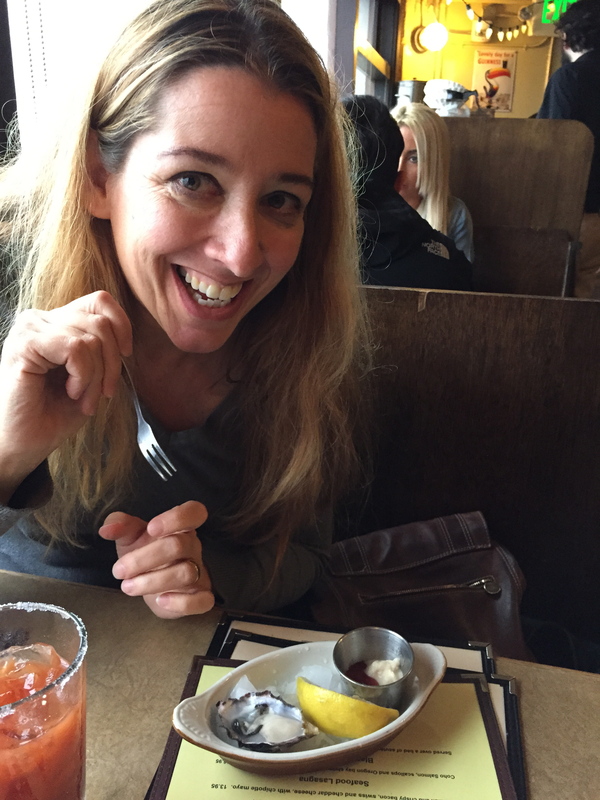 If I can eat an oyster, I can (try to) eat anything. The Athenian is famous. Big wood bar, mirrors, tiles, and a panoramic view of Puget Sound with low booths along those windows. Best of all, it doesn’t have a smidge of the modern restaurant about it. Everything looks old and real. 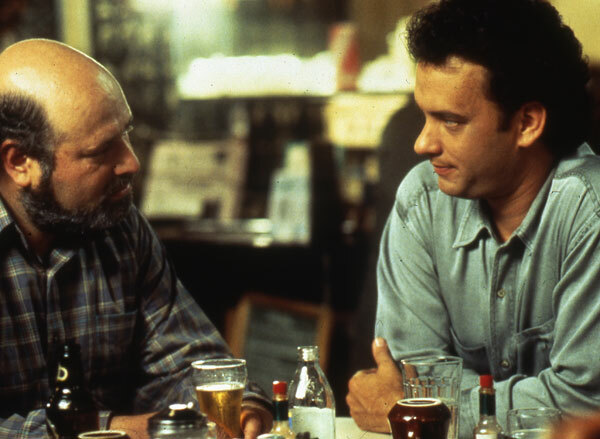 Tom Hanks and Rob Reiner in the Athenian. In this scene from Sleepless in Seattle, they talk about tiramisu, not oysters. And, importantly, the Athenian is where a great scene in the movie, Sleepless in Seattle was filmed. Susie and I are very happy to be here. We sit in front the ferris wheel. It’s almost as if we are joining our old friend for lunch. The waitress comes and I order a Bloody Mary. Susie’s eyebrows go up. I’m not a big drinker, but it’s my birthday and I’m 50. I’m a woman who thinks nothing of having a bloody mary for lunch! I’m living with gusto. And, (also) I’m seeking some courage. The lengths they’ve gone to, to pretty things up, are impressive. She’s clearly wondering how we can still be talking about this. This is really the crux of the matter for me. As I’ve been sitting here I’ve been wondering, really wondering (as in picturing and strategizing), what I’m going to do, here in this public place, with Susie sitting about 10 inches from my face, if I GAG on this thing. Will I spit it out? Will it make me barf or heave or choke? These are grim thoughts, but there’s a reason I’ve made it all the way to 50 without eating an oyster. Now you know. I pick up the shell and look at Susie. She’s smiling, encouragingly. She’s grabs my iphone and takes a picture. I put the oyster down. I pick up the oyster again. I look at it. And I put it down. “What’s my problem,” I groan. I look at Susie. She’s right. That, (among other things) is my problem. My mind flashes on all the things that will require me to pull the trigger. I will have to make myself jump into water from a height. I’ll have to get up on a stage and grab the microphone for karaoke, stand up comedy, and (oh my god) a TED-type talk. I pick up the half shell and tip its contents into my mouth. I chew twice. My teeth slice easily through it. This isn’t a rubber band, like calamari, or doughy like mochi. Most notably it’s very cold. The chill feels amazing. Like bright, sparkling beer on a hot day. Like vodka straight from the freezer. The lemon and cocktail sauce are familiar and dance with the delicate flavor of salty oyster. I order another oyster. (Yes, I do it again, right away, because that’s how good they oyster was. I don’t want to forget or think it was a fluke or a manufactured memory or the Bloody Mary was talking or anything like that.) And I think about how much I’ve maligned the oyster. A creature with so much to offer, not to mention a creature capable of creating pearls! Sure, in the harvest of 3 tons of oysters, only 4 will have made a pearl. But that possibility delights me. The lowly, ugly oyster with so much to contribute the environment, and the potential to produce a jewel. There’s inspiration there. Thank you, oyster. And I think of that expression: The World is Your Oyster. It’s from Shakespeare and actually means that the person in question has a lot of choice in the matter, or that you’re in a position to take the opportunities that life has to offer. But to me, now, it means that my life is filled with things that I’ve pre-judged. Today the world is my oyster and plan to give it a try. The world may be filled with surprises for me because the world is my oyster.